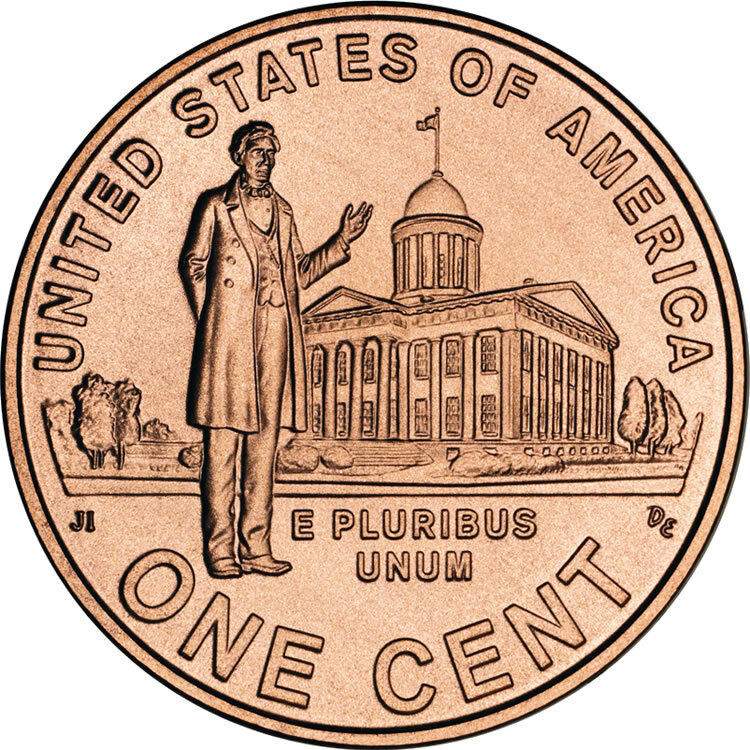 Originally released in 1909 to celebrate the 100th anniversary of the birth of Abraham Lincoln, the Lincoln Penny would introduce a radical departure from normal US coinage designs of the country. Up to this point in history, historical portraits were not used on any regular issues of coins produced by the US Mint. In fact, the first President of the United States George Washington is said to have refused to allow his likeness to be incorporated into any coins. He felt, and most agreed for decades, that a portrait of a real individual was too similar to the practice of using images of royalty on coins used by the monarchal governments of Europe. The only consistent portrait used on US coins was that of the mythical Liberty. President Theodore Roosevelt would initiate steps in the early 1900’s that would change the look of US coinage ever since. He felt at the time that US coins were drab and un-inspiring. He wanted American coins to showcase the talents and might of the United States, a country that was blossoming into a world power. Also, Roosevelt felt the country owed its current existence to Lincoln who had led the country during it’s greatest internal struggle, the American Civil War. Combining these two thoughts, President Roosevelt commissioned Victor David Brenner to design a new cent that would feature an image of Abraham Lincoln. 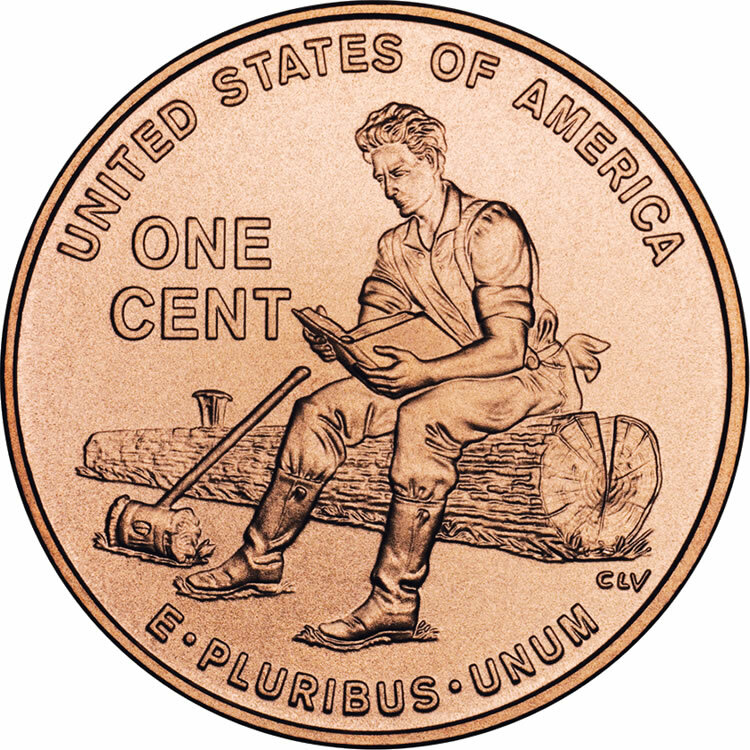 Lincoln penny - reverse design used from 1909-1958. The likeness was to be similar to a sculpture Brenner had completed years earlier based on a Mathew Brady photograph. 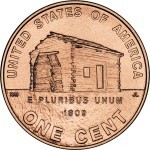 It showcased the portrait of Lincoln facing to the right on the obverse of the coin. Of interest, the new Lincoln Cent was also the first cent coin to include the motto “In God We Trust.” The inclusion of this motto had been authorized by congress in 1865, while Lincoln was still President. Also included on the obverse was the inscription “Liberty” and the year of mint. A new design in place, the US Mint began production of the coins during the summer of 1909, 100 years after the birth of Lincoln. 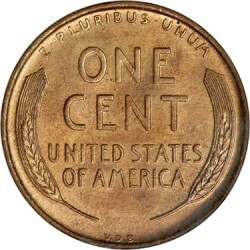 With the exception of a few changes including deletions and inclusions of Victor Brenner’s initials, the obverse has not significantly changed in over 100 years. 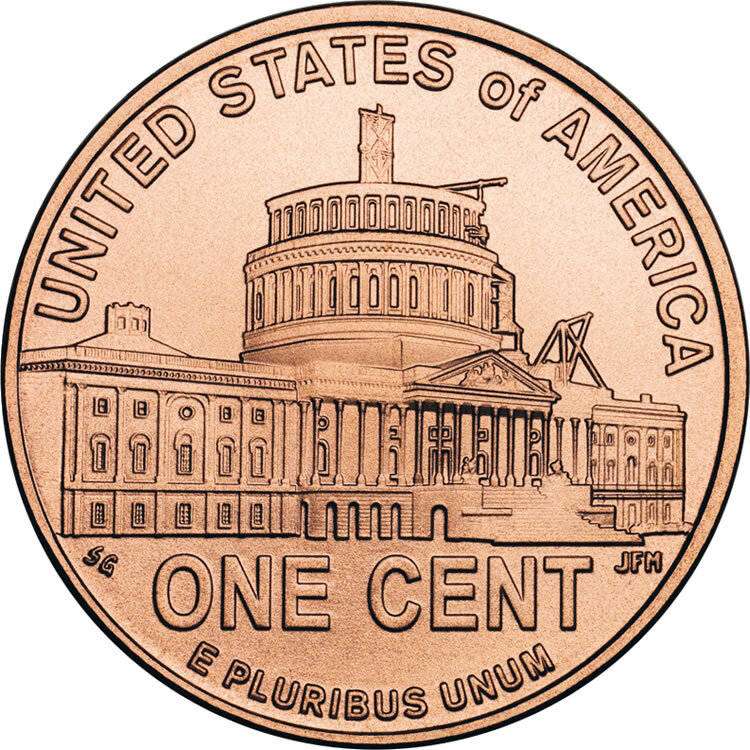 Lincoln Memorial penny - reverse design used between 1959-2008. 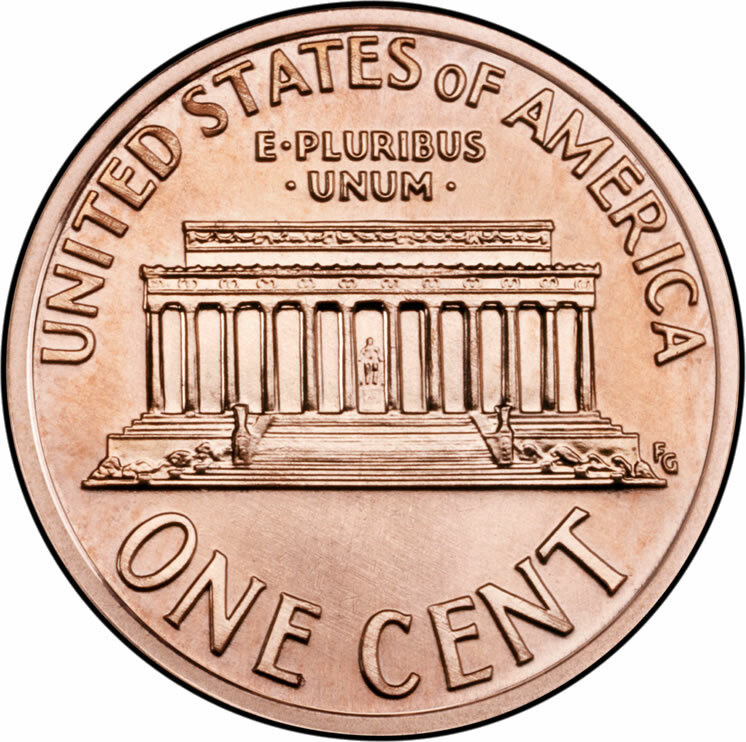 In 1959, marking the 150th anniversary of the birth of Lincoln, the reverse of the cent was changed from the wheat heads to an image of the Lincoln Memorial, designed by Mint engraver Frank Gasparro. This first major design change in 50 years would itself last 50 years. 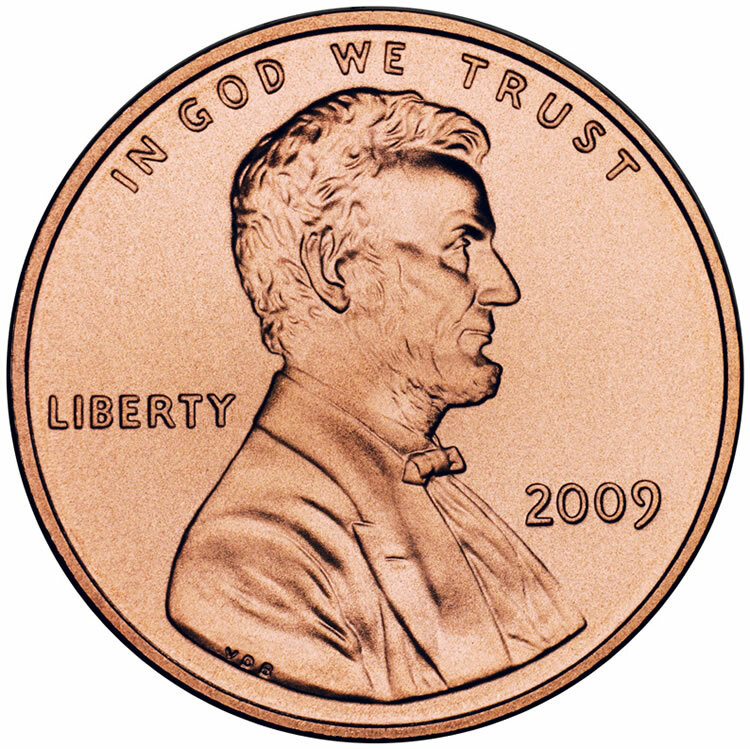 The original metallic composition of the Lincoln Cent was set the same as the Indian Head Cent that had come before it, 95% copper and 5% tin and zinc. The alloy remained the same until shortages during World War II forced a change. 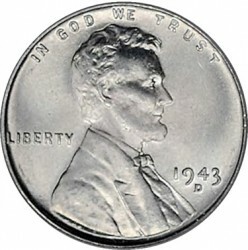 Faced with no supply of copper (all was being directed towards military efforts), the US Mint started producing zinc-coated steel cents in 1943. This combination proved problematic both for use as currency and for the expected life of the coin. The coins had a grayish color making them hard to differentiate from the dimes and the zinc-coating process proved unable to prevent tarnish and rust. Consequently, in 1944, the Mint modified the composition again, this time using melted expended shell casings. This alloy was similar to the original except it had less tin. With the end of the War, the Mint went back to its original composition of 95% copper and 5% zinc and tin. In 1962, the Mint removed tin from the alloy, feeling that doing so would have no ill effects on the coin and would simplify production. The change was authorized by Congress on September 5, 1962. In the 1970’s, the Mint contemplated changing the alloy again as the price of copper was spiraling upwards. An attempted aluminum cent was struck, but was in the end scratched as among other things, it did not show up on x-rays if swallowed. Although over 1.5 million of the aluminum coins were struck, they were not officially distributed for commerce and are considered illegal to own. Only a few samples are believed to be still in the hands of the public. The final change of composition occurred in 1982, when the Mint switched to copper-plated zinc (97.5% zinc and 2.5% copper). While the Mint realized significant savings with making the switch, collectors have never been satisfied with it as the new composition is much more likely to corrode. Birth and Early Childhood in Kentucky - The reverse was designed by Richard Masters and sculpted by Jim Licaretz to show a log cabin, signifying the birthplace of Lincoln near Hodgenville, Kentucky. It was released to the public on February 12th, 2009 during a ceremony held in Hodgenville celebrating 200 years since the President’s birth. Formative Years in Indiana - This design by Charles Vickers has Lincoln taking a break from rail-splitting and reading a book. It was released on May 14th, 2009. Professional Life in Illinois - Designed by Joel Iskowitz and sculpted by Don Everhart, this version places an image of Lincoln in front of the old state capitol building in Springfield, Illinois. It was here he became a lawyer and first ventured into politics. This coin is slated to be released on August 13, 2009 at a ceremony on the grounds of the old state capitol building. Presidency in Washington D.C. - A release date of November 12, 2009 is set for the final 2009 Lincoln Cent designed by Susan Gamble and sculpted by Joseph Menna. It features a half-completed US Capitol dome, as it appeared during Lincoln’s Presidency. 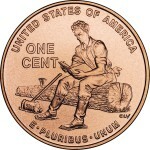 The freshness of the penny designs greatly increased public awareness of the cents. A frenzy of excitement occurs at launches, and with collectors in particular who seek the new coins that are issued in equal intervals every three months. 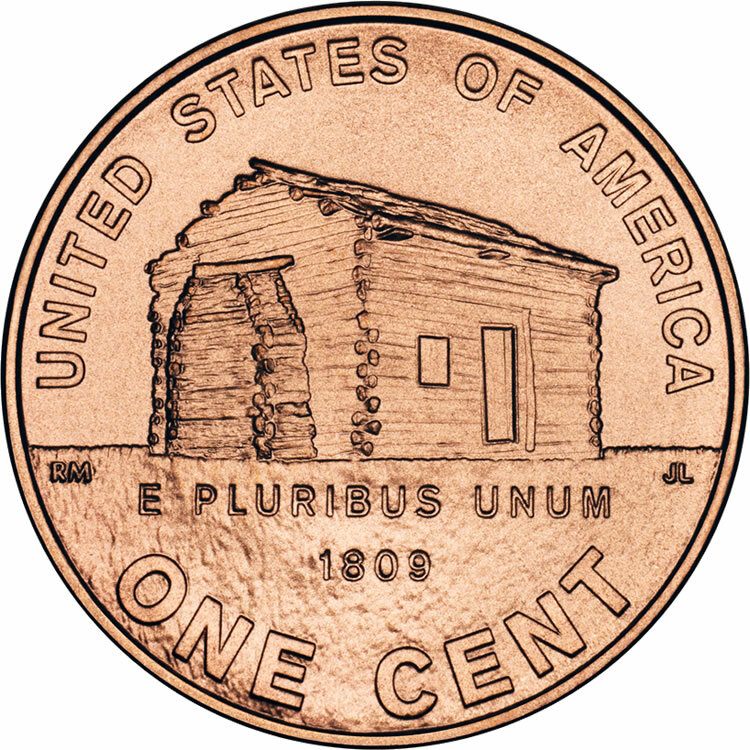 Although the United States Mint has struck hundreds of million of each with mintages of 638.8 million of the Log Cabin and 739.6 million of the Rail Splitter design, finding the coins in circulation proved to be a difficult task in a country struck by recession. The public as a whole returned once hoarded change and jars of pennies back into the banking system, resulting in an inventory build-up of old coins at banks and reducing or eliminating the need to order new coin replacements from the Federal Reserve system. 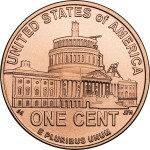 As a solution of sorts for collectors, the United States Mint began selling two-roll sets of the 2009 pennies for $8.95. The sets include one roll of 50 coins from the United States Mint at Philadelphia with no mint mark and one roll of 50 coins from the United States Mint at Denver bearing the “D” mint mark. Despite the extra cost, the first rolls sold out in less than two weeks with 96,000 ordered. 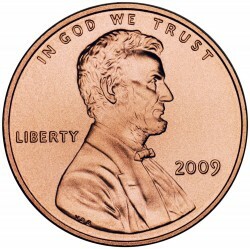 The United States Mint increased limits with the Formative Years penny and has sold nearly 300,000 rolls to date. To help anticipate demand and fulfill orders for the final two cent releases, the United States Mint added the coins to its subscription program. That enabled the public to place orders before the coins were issued. 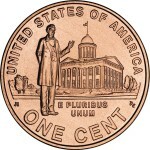 The third 2009 Lincoln penny design will be issued on August 13 at the Old State Capitol in Springfield, Illinois — the same building that is depicted on the background of the coin. Bicentennial Lincoln coin excitement resulted in increased media attention — most particularly during the first launch. News reports are wide, with several interesting perspectives in the form of penny videos. 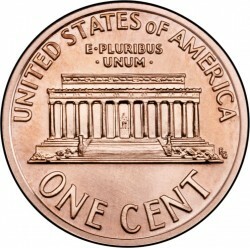 Continuation of the Lincoln Cent in 2010 was prescribed in the Presidential $1 Coin Act of 2005 requiring that it “shall bear an image emblematic of President Lincoln’s preservation of the United States of America as a single and united country.” As such, a new reverse design is being considered by the Mint, and the winning proposal will be announced later in 2009. Copyright © 2009 Lincoln Pennies.